We’ve been helping injured workers with their workers’ comp claims for many decades and developed a list of common questions about workers’ comp in Colorado. Q: When Can I File For Workers’ Compensation? A: As quickly as possible and within four days. If you’ve been injured or become ill at work, you may need to file for workers’ comp in Colorado. Workers’ compensation pays for medical care, rehabilitation, and some wage replacement if you have to miss work. To get these benefits, you must file a claim. Your employer is required to file a report through the Division of Workers’ Compensation within three days of the injury. See the workers’ comp in Colorado timelines here. Q: After I report a workers’ comp injury, what are the next steps? Do the above in that order. Consider hiring a workers’ comp attorney to help you make sure you receive all the benefits you are entitled to. Make sure you have someone in your corner, acting as your representative. For example, some employers fail to admit to some benefits you are entitled to, or they may have not correctly represented the benefits owed to you. Getting medical treatment is important following your injury. The insurance company and your employer are supposed to direct you to a doctor. If you do not like the doctor they chose, let your attorney know. Your primary doctor will treat you until you have reached what’s called Maximum Medical Improvement – meaning, in that doctor’s opinion, you have recovered from your injuries as much as you ever will. At that point, you are entitled to receive money for your injuries provided under a very complicated calculation set forth in the law. Even after you reach MMI, under some circumstances, you can continue to receive medical care. Your attorney will help you get a second opinion from another doctor if you are not happy with the treating doctor’s final opinion. 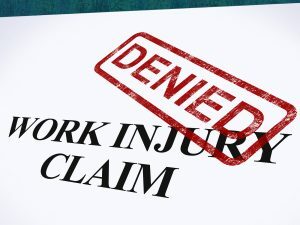 Q: What if My Workers’ Comp Claim Was Denied? A: Call a knowledgeable and experienced workers’ comp attorney. Unfortunately, insurance companies can deny your claim without any clear reason – stating it’s not a work-related injury. Sometimes, they deny the claim because they are trying to buy more time. We’ve written about the reasons insurance companies use and how you can appeal here. Other times, insurance companies might file a partial admission. For example, they might admit liability to pay for your medical expenses, but deny paying your lost wages. Workers’ comp in Colorado can be a difficult process to navigate, so don’t go it alone. Or, an employer might file a notice of contest. Regardless of what your employer does when faced with your workers’ comp claim, your attorney will act on your behalf to recover what you deserve. Q: What if I Can’t Keep Coming to Work? A: A workers’ comp attorney can help you recover your lost pay. After your injury, you may miss work because you are seeking treatment and dealing with the insurance company. Even if the insurance company accepts liability for your medical expenses, you may not necessarily get all of the compensation you’re entitled to – such as lost wages, mileage for doctor’s visits, and other benefits.